Perched atop a solitary mountain is the oldest monastery in Cyprus, Stavrovouni Monastery was founded in the 4th century by Saint Helena. Its most treasured relic is a supposed fragment of the holy cross, encased in a silver cross which is not visible to the public. Another artefact left by Helena at the monastery is the Cross of the Good Thief, which includes the nail and part of the rope said to have tied Jesus to the cross. The monastery is perched upon the eponymous mountain that used to be called Olympus. 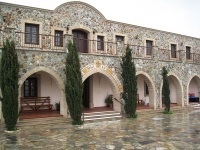 Reached by a winding steep road, the monastery is considered the spiritual centre of Cyprus and now houses an order of monks.